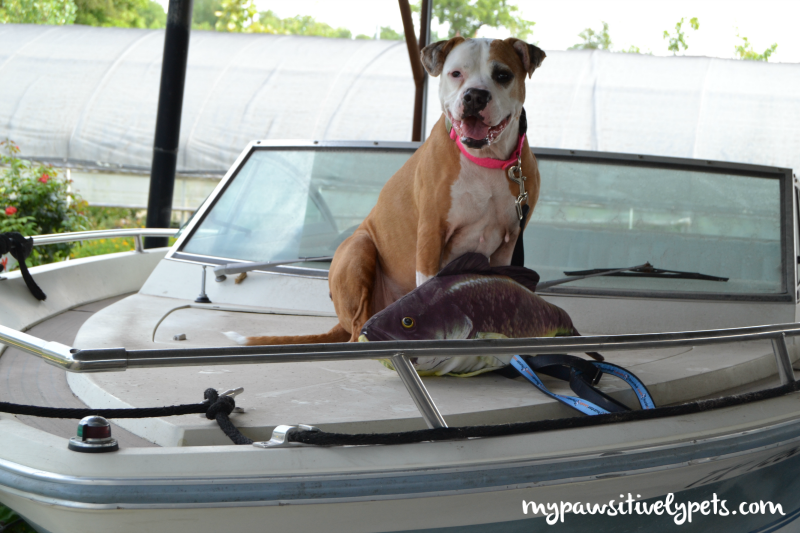 It's no secret that Shiner loves her fish. Eating it, that is. Fish is a good source of protein for dogs that is rich in Omega 3 fatty acids and it's great for healthy skin and coat. It gives Shiner the energy she needs to be active as an 11 year old senior dog. Sure, she likes to be lazy every now and then but Shiner is very active for a senior dog. She loves running in our big open field after rabbits, chasing sticks, and going for walks. If it weren't for the dog, I might even lose my own motivation to be active. She is like a kind of energy for me in herself and encourages me to get outside and do something, even if it's just spending time doing some work in the garden. Check it out! I'm on a boat and I caught a fish! Who's driving this thing anyways? Which is why I want to make sure she stays active, healthy, and keeps her energy levels high. One of the best ways I can support Shiner's healthy energy level is by giving her good food. 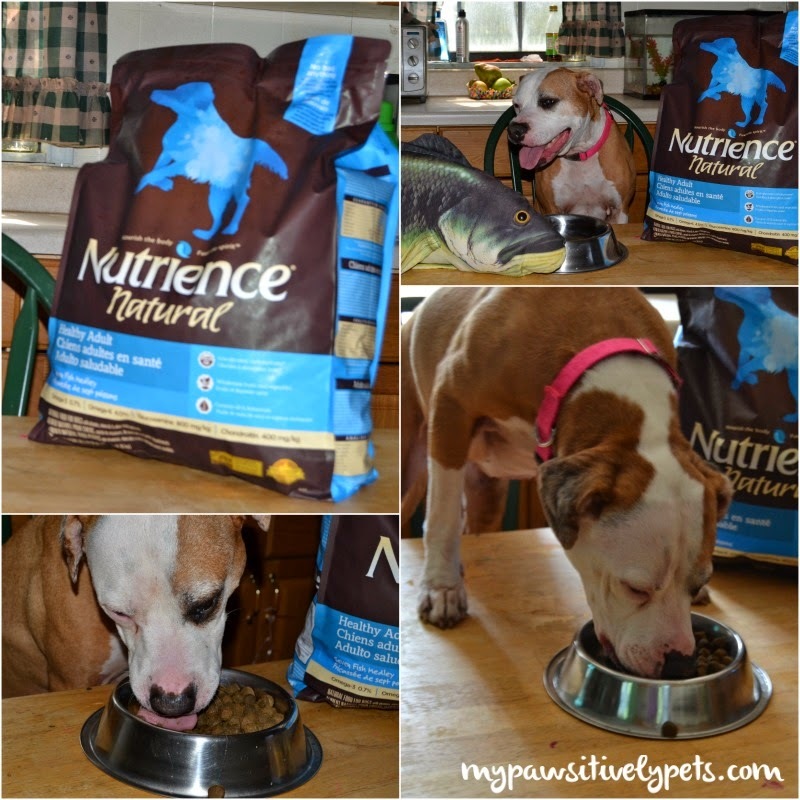 We recently came across a great catch - Nutrience Pet Food. I was immediately drawn to their Nutrience Natural line because they have a fish recipe - Healthy Adult - Seven Fish Medley. Although, I'll admit it was hard choosing a food because they have so many superior options including their Grain Free, Natural, and Original lines of dog food. All of the fruits, vegetables, and botanicals used in their dog food are harvested at their peak and paired with top of the line meat and fish proteins. Reading the ingredients list alone left me feeling confident that this food was made up of the good stuff. But then I researched a little more about Nutrience Pet Food and I was even more confident in feeding this food to my own dog. What do you mean I have bad table manners? Nutrience is a Canadian company who's dog food is now available for purchase in USA through Amazon. Nutrience Pet Food sources all of their ingredients from the best Canadian and US growers. They have a "no bad anything" promise which is backed by the quality North American ingredients they use in their dog food. Nutrience makes their food in small batches and every bag represents an unwavering attention to quality and an ongoing commitment to natural, wholesome nutrition. Shiner loves her new food, which keeps her active and full of energy. Although, she does seem slightly concerned that this means we won't need to go fishing anymore. Don't worry Shiner, we have plenty of fun activities on our to-do list to keep us healthy, including fishing! I guess this means our Mr. Fish pillow is off the hook! Can I have some of my Nutrience now? You can keep up with Nutrience on Twitter @Nutrience_ and on Facebook too. To Purchase Nutrience for your dog, just click here. This post is sponsored by Nutrience and the Pet Blogger Network. I am being compensated for helping spread the word about the Nutrience, but Pawsitively Pets only shares information we feel is relevant to our readers. Nutrience is not responsible for the content of this article. We love fish too Shiner. Sounds yummy. We have missed you. I'm a big fan of fish ( think I have some feline genes). I will look at amazon, maybe they ship international too? if not... can you borrow me your boat? Haha sure Easy! The boat we used for these photos is not the one we usually take out, thus it's a little dusty. We keep the one we use at the lake. What a big fish you caught yourself! If that giant tongue is any indication looks like you thought dinner was delicious! I love fish too, Miss Ann! I bet that food is SUPER delicious (just look at those first 5 ingredients) and super healthy. So glad that Shiner likes it and that it is helping to keep her fit and active! Fish is super popular at our house! Less tummy issues too :) Thanks for the info! I've read about this stuff on a couple of other blogs too. It sounds great! Shiner and Ash would probably make great play mates chasing squirrels and rabbits! We should have tried the fish food but I was a little worried she wouldn't like it! Love the last picture! That tongue is awesome! Well, it sounds like she really enjoys the kind that you did get! You kitties might be in luck because they make cat food too! That was very interesting Shiner and I didn't really know that dogs liked fish! I had to google menhaden. I had never heard of it...lol. Glad Shiner likes the new food. 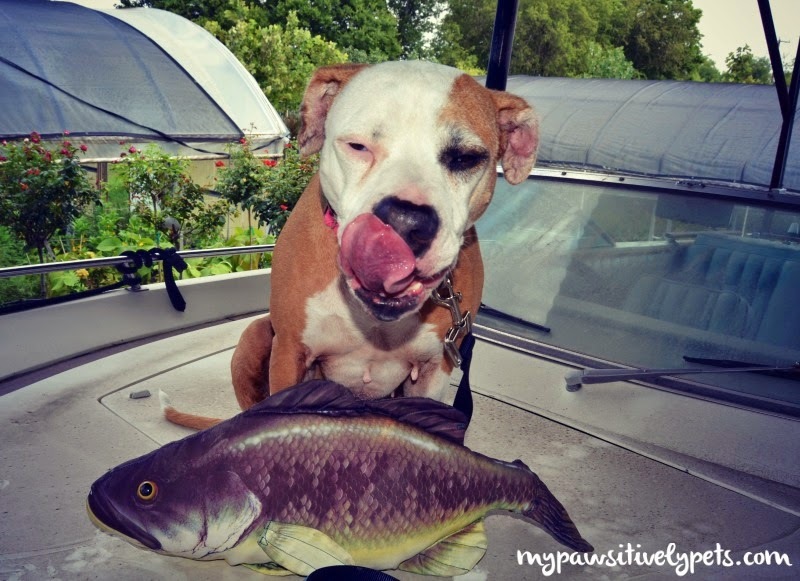 We never knew dogs like fish, Shiner! My dogs love fish, too! This food sounds really good, thanks for sharing.